I love road trips. Anywhere and everywhere. It’s even better when the destination is of historical significance. 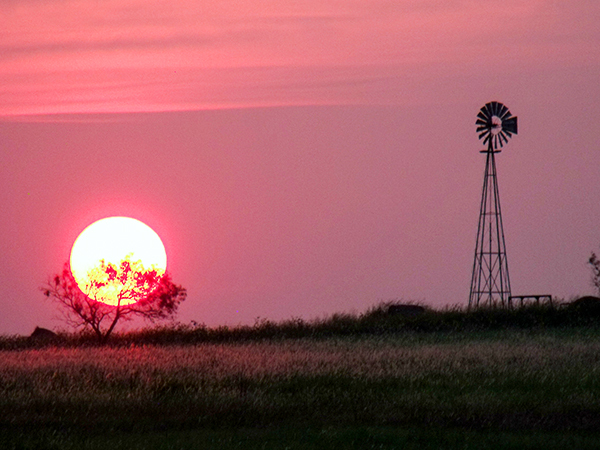 In Texas, it all comes together on the Chisholm Trail. You may have heard of the Chisholm in your high-school history class or, more likely, in an old western movie. 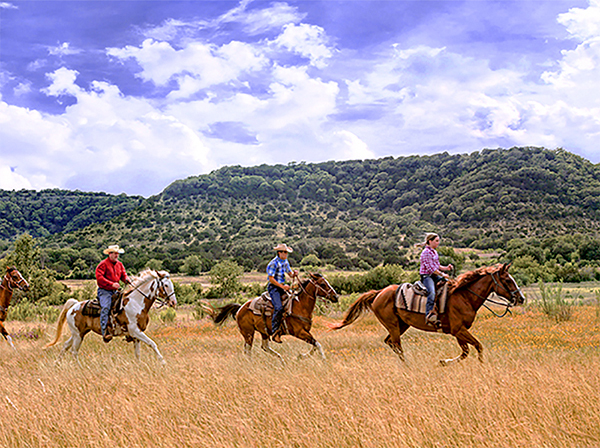 In fact, the Chisholm is the trail that made the American cowboy an enduring folk hero throughout the world. It was used only from 1867 – 1884 before barbed wire and an 1885 quarantine law caused it to close. But during that time cowboys drove more than 5 million cattle and 1 million mustangs up it. It was the greatest migration of livestock in world history. Following the South’s defeat in the Civil War, Texas Longhorns were a primary source of income for impoverished Texas. Thankfully, there was a demand for beef back east, and Texas had a growing supply. Also, the U.S. Government needed to feed Plains Indians on reservations and soldiers in forts. Consequently, from 1867-1884 cattlemen drove their herds from all over southern Texas to San Antonio. From there they moved north to Fort Worth, and then on to a newly built rail head in Abilene, Kansas. Today San Antonio is a good place to start a Chisholm Trail road trip, as well. There are numerous things to do in San Antonio whether you’re following the Trail or just wandering about the city. One thing to do is to visit the 19th-century Buckhorn Saloon and Museum. It has an eccentric collection of antlers, horns, and stuffed animals and buttermilk pie in its restaurant. Purportedly, Teddy Roosevelt and his Rough Riders used to visit the place. So did Pancho Villa, it’s said, who allegedly planned his revolution here. This map shows the route from Cuero to St. Jo. It is interactive; press +/- to enlarge it or make it smaller. It can also be viewed, and the route followed, on your smartphone. Unfortunately, San Antonio’s Texas Pioneer, Trail Drivers, and Texas Rangers Memorial Museum is currently closed for renovations. If you can, though, drive to Cuero, 1½ hours east, where you’ll find the Chisholm Trail Heritage Museum. From San Antonio head north on I35 towards Georgetown, about a two-hour drive. (History buffs can stop in Austin where the Texas State Library has documents covering all phases of Texas history). Historic Georgetown revels in the fact that four areas of the city are listed as National Register Historic Districts. 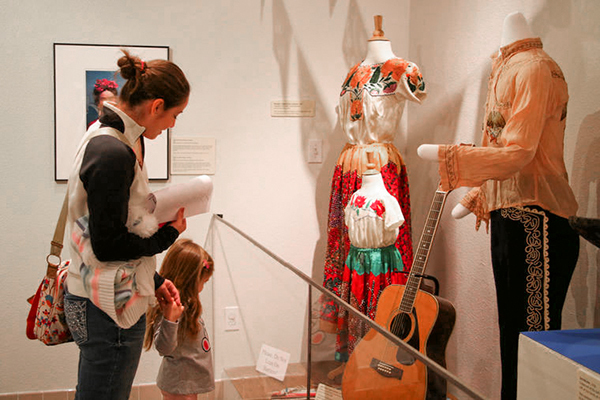 Also of note is the Williamson Museum with its exhibits relating to the culture and heritage of Williamson County. 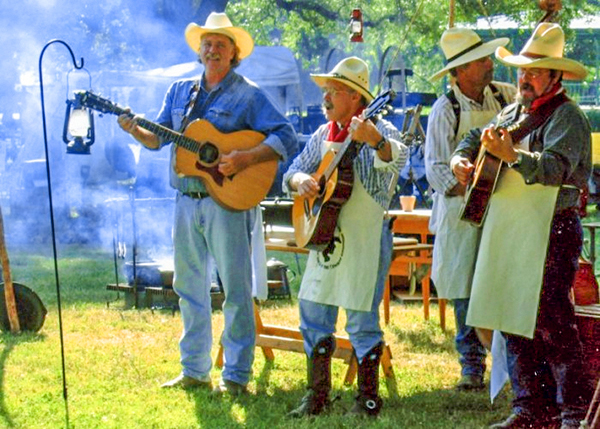 The museum hosts an annual Chisholm Trail Days Event at San Gabriel Park in October. There’s also a Pioneer Day at Old Settlers Park in May. Both include hands-on educational programs, exhibits, and tours. Check with the museum for this year’s dates. 20 minutes north of Georgetown you’ll enter Salado, where Main Street was actually part of the Chisholm Trail. In fact, in one area of town ruts from wagon wheels still appear in the bedrock. You may want to visit the 1861 Stage Coach Inn, which claims to be the oldest continuously operating Texas hotel. It was originally named the Shady Villa Inn and was a site on the Chisholm Trail. Its guest book ostensibly included the signatures of Robert E. Lee, Sam Houston, General George Custer, Jesse James and others. One will never know, however, since the registers mysteriously disappeared years ago. Leaving Salado, continue on I-35 for 12 miles, and you’ll come to Belton, the county seat of Bell County, TX. A tributary of the Chisholm Trail, it cut across the central part of the county. Belton’s Bell County Museum celebrates the trail with the unique “Up the Chisholm Trail” monument. Its 17 bronze panels, three Longhorns, barbed wire, and Texas star represent various aspects of the history of the trail. It’s a unique, educational interpretation of a significant aspect of Texas history. Continue up I-35 to Waco but exit the freeway before you reach the Brazos River. Follow the river a few blocks westward to Indian Spring Park and the western approach of Waco’s Old Suspension Bridge. It’s the grand dame of the city. Completed in 1870, it took 2.7 million bricks to construct and is really part of the Chisholm Trail. It was an easier crossing for drovers and their cattle than the sometimes-treacherous Brazos River below. Even so, back in those days paying the toll for a herd could often prove costly. 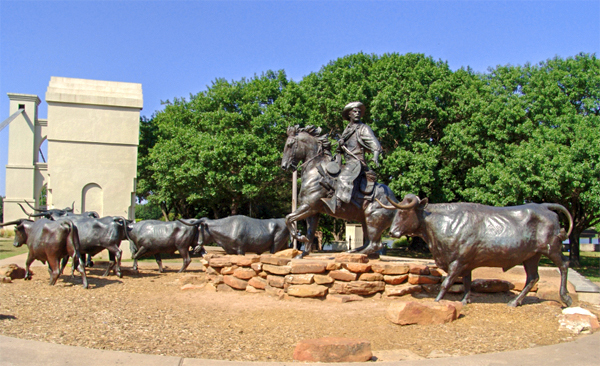 Near the western approach to the Waco Suspension Bridge, you’ll find the bronze sculpture “Branding the Brazos.” The larger-than-life artwork depicts three cowboys – a white, Hispanic and black – driving a herd of cattle to the bridge. The sculpture, part of the Waco Chisholm Trail Heritage Monument, is now one of the most-photographed sites in the city. You’ll find it near the bridge in Indian Spring Park. Bring your kids and camera. Continue on I-35 to Fort Worth, which served as a supply depot for the Chisholm Trail. It’s only a 1½-hour drive north, and chockablock with plenty of western history, memorabilia, and excitement. Your target here is the Stockyards National Historic District, where restored mercantile buildings and corrals preserve the city’s great past. It covers 15 square blocks filled with entertainment, restaurants, and shops. 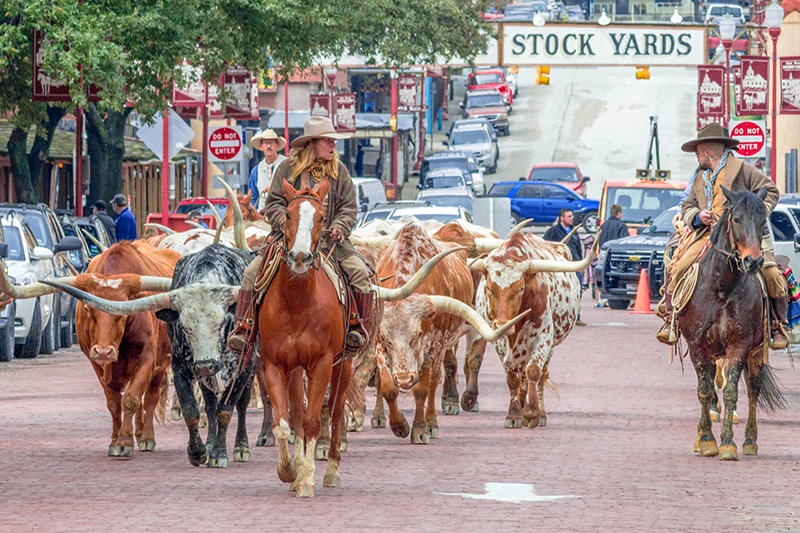 Incredibly, there’s even a cattle drive down the main street, at 11:30 am and 4:30 pm daily. Authentic cowboys and cowgirls in period clothing from the Chisholm Trail era drive the herd. There’s also the Cattle Raisers Museum, which will regale you with the history of the Texas ranching industry. Also visit Thistle Hill, the last surviving mansion of cattle baron era, only five miles away. 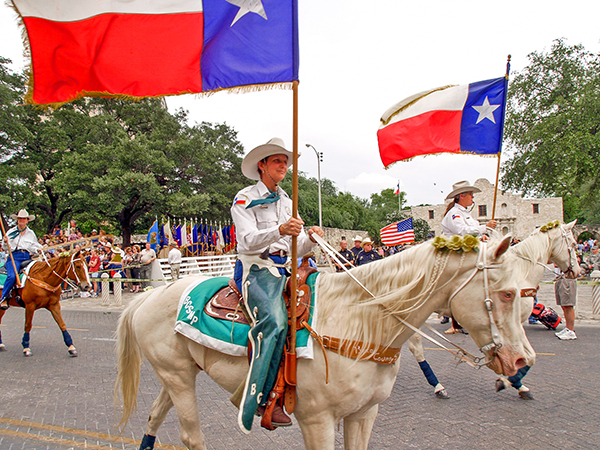 Additional places to visit include the National Cowgirl Museum/Hall of Fame, Texas Cowboy Hall of Fame, and Sid Richardson Collection of Western Art, among others. 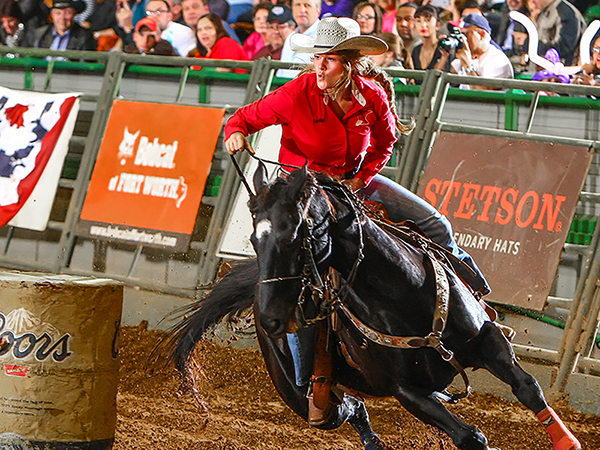 If you haven’t yet had your fill of western action, join the crowds at the Stockyards Championship Rodeo. It’s held every Friday and Saturday night. If you can break the kids away from the cowboys and cowgirls, you may also want to take a ride on the Grapevine Vintage Railroad. To follow the Chisholm Trail to the Oklahoma border on the Red River, continue on I-35 north to Gainsville. There take Route 82 west to Route 81 and the Red River. En route, stop in little St. Jo (population 977) at the Stonewall Saloon. A welcome stop for thirsty drovers moving cattle along the Chisholm Trail, it was the first permanent structure in town. 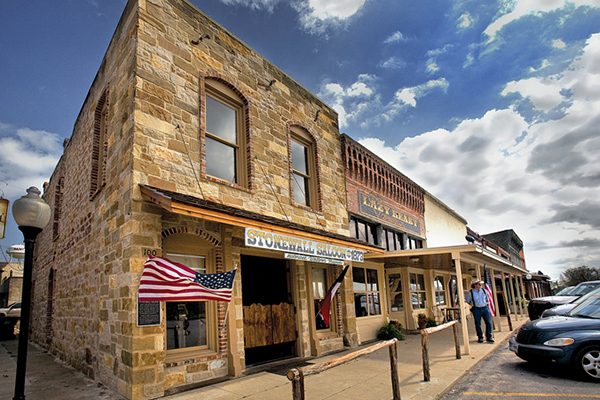 Today the saloon serves as a museum depicting the history of Saint Jo and the Chisholm Trail. For suggestions on discovering more great Texas road trips go to www.traveltexas.com. Love all the Texas pictures. Reminds me of my last visit.